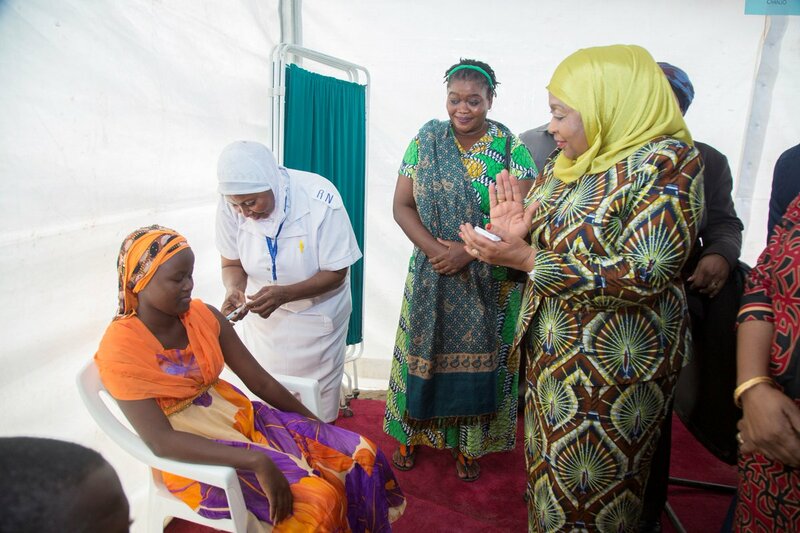 Young women in Tanzania receive the HPV vaccine at a local ceremony celebrating the beginning of a vaccination campaign. It’s an audacious goal: protect 40 million girls across 40 developing countries against HPV by 2020. This is a goal of Gavi, the Vaccine Alliance. And it must be met if we are to prevent the needless deaths of hundreds of thousands of women from cervical cancer around the globe. It’s a goal that Jhpiego is committed to support, in partnership with Gavi and local governments. Each year, about 493,000 women develop cervical cancer, and new estimates suggest as many as 311,000 women die from the disease. However, unlike many other cancers, cervical cancer is preventable by vaccination. Reaching millions of girls with the HPV vaccine can help ensure that the next generation of women and mothers don’t die needlessly. In countries from Afghanistan to Zambia, access to “screen-and-treat” services for women are an important part of a comprehensive approach that can prevent a large number of cervical cancer deaths. Such services use visual inspection of the cervix after application of acetic acid, coupled with immediate treatment in what is known as the single visit approach. Unfortunately, there remains a major global equity gap in access to these preventive services. Nearly 90 percent of deaths from cervical cancer occur in the developing world, where close to 80 percent of the women lack access to these lifesaving, preventive interventions. 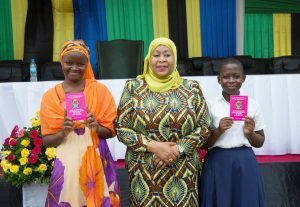 These two young girls were the first to receive their pink ticket to health – certifying that they’ve been vaccinated against HPV. For the last 25 years, Jhpiego has worked to close this gap and save lives. Since 2009 alone, Jhpiego has provided technical assistance to 23 countries to establish and scale up cervical cancer prevention and treatment programs, benefiting countless women and families. Using a comprehensive strategy, including the use of HPV vaccination for primary prevention, together with secondary prevention using the single visit approach, Jhpiego is expanding access to cervical cancer prevention services for the most vulnerable. We are partnering with communities to inspire vaccine confidence and to ensure that the most vulnerable girls are reached. And we are working with governments and health systems to strengthen routine vaccine delivery systems and build the capacity of health care providers. Jhpiego is also testing new technologies to greatly increase access to and use of prevention services. In Botswana, we led a research study in which more than 1,000 women received instructions and the means to self-test for HPV in a private setting. Nearly all of the women—97.3 percent—said they experienced minimal to no discomfort and that they would recommend the HPV self-collection method to others. HPV self-screening offers a prevention approach closer to or even in women’s homes, making it part of a strategy to increase equitable access to cervical cancer services in places where girls and women need it most. Though the HPV vaccine, which is highly effective, has been commercially available for a decade now, less than 4% of girls in low- and middle-income countries have access to it. If access is expanded, the HPV vaccine has the potential to reduce the disease burden for hundreds of thousands of women across the globe. Through our partnership with Gavi, Jhpiego supports efforts in four countries to vaccinate young women so that they never have to worry about cervical cancer. This support includes helping the government of India to decide and plan for national HPV vaccine introduction, and assisting ministries of health in Tanzania and Ethiopia to introduce and roll out HPV vaccination nationally this year. We are also working alongside the government of Pakistan to ensure a robust plan to undertake HPV vaccination efforts. The goal of reaching 40 million girls with the HPV vaccine is indeed an audacious one, but if all stakeholders are committed to this goal, together with access to secondary prevention services, our collective work has the potential to make cervical cancer a disease of the past.